“Cosmetic Veneers are an ideal solution to cosmetically enhance your smile while still maintaining healthy tooth structure”. Porcelain and Composite veneers are an ideal solution to cosmetically enhance your smile while still maintaining healthy tooth structure. Imagine not seeing those worn tooth enamel, misaligned teeth, discoloured teeth, or chipped and cracked teeth! These veneers consist of thin tooth coloured layers of specifically shaped porcelain or composite resin that are bonded to the facial surfaces of your teeth in order to improve the aesthetic outcomes of your smile. The advantage of veneers are that minimal tooth preparation is required , so there is less damage done to your teeth. An initial consultation with your dentist is required to assess your aesthetic concerns and to perform a smile assessment. Incremental amounts of tooth structure, usually enamel will be removed, to allow for an overlying veneer to be fabricated. If a porcelain veneer is the treatment of choice, an impression of the veneer preparation will be taken using a PVS material. A temporary veneer will then be fabricated to protect the underlying tooth structure and this will be bonded on temporarily. The impression will be then sent to a dental laboratory, where a porcelain veneer will be fabricated. Once returned, the dentist will call you back for insertion whereby the temporary veneer will be removed and the porcelain veneer will be tried in and cemented with permanent cement. For a composite veneer, the dentist will layer incremental amounts of composite resin directly onto your tooth. Q. Should I choose Porcelain veneers or Composite resin veneers? The two most common materials used to create dental veneers are composite resin and porcelain. Indirect (created outside of your mouth) porcelain veneers are made by a dental technician in a dental laboratory. Direct (created directly on your teeth) composite veneers are made by your dentist during your appointment at the dental office. Porcelain veneers are highly aesthetic and are more appropriate solutions for severe cases involving dullness, wear, discoloration, extensive chipping, cracking, spacing or uneven teeth. 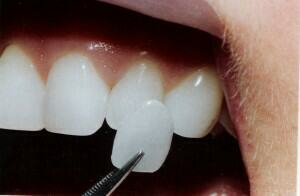 Composite veneers provide a cheaper alternative to porcelain veneers. They are also an effective and minimally invasive way to restore and correct small chips, cracks and discoloration in the teeth. However they may no look as good over time and so may need to be touched up. If your are unhappy with the colour of your teeth but are happy about the shape and alignment, then bleaching your teeth may be the first option. If you have crooked teeth, then veneers may be appropriate. Sometimes both bleaching and veneers are used to obtain the best result. change the appearance of crooked or misaligned teeth. The removal of any natural tooth structure is permanent. At Just Dental Care, we prefer to offer patients the most minimally invasive options first. If your natural teeth are functionally and aesthetically adequate, veneers may not be an appropriate treatment option for you. If you would like to know more about veneers, please contact us for a free cosmetic consult.